Yes, that's right, at one point early this morning EST Volkswagen AG was up 100% and surpassed Exxon-Mobil as the largest company in the world. The move has been blamed on a short squeeze, but could you really imagine XOM going up $70 in the first hour of trading? Subscribe to Birinyi Associates' Mini-Institutional service to stay ahead of the tape (and the street) on gyrations caused by market structure not market participants. There are still more bulls than bears this week. 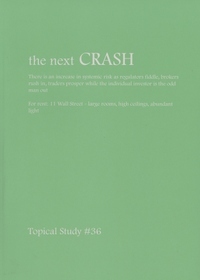 the next CRASH was written and distributed to Birinyi Associates' clients in August of 2007. In it Mr. Birinyi questioned the rationale behind structural changes such as decimalization, ECNs, and increasingly more complex trading strategies and vehicles. As a result of the essay, Birinyi Associates arrived at the conclusion that "the markets in the first decade of the 21st century are prone to systemic failureas a result of technological innovations and utilization, rapid growth of sophisticated but not necessarily vetted instruments, and other changes in the wide world of finance...We believe the various structural reforms of the 1990s have not achieved the desired effect with regard to the individual." We continue to wonder why nobody is PISSED. These kinds of market gyrations have not occurred since the 1930s, and as much as international financial markets have been disrupted, changes to the structure of the stock market have gone seemingly unnoticed. Specialists and the services provided by the New York Stock Exchange have been removed from the picture causing market anomalies that are detailed in the publication, but have also been highlighted here. What we have witnessed over the last two months has been the culmination of complex instruments and that the theories on which they were founded are both flawed and short sighted. 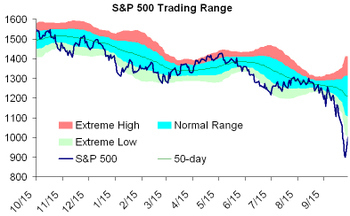 Below we highlight some of the charts depicting not weakness, but market irregularities. Birinyi Associates continues to be on the forefront of market research and analysis. Their work and commentary is featured by Forbes, Reuters, Bloomberg, the Wall Street Journal, Barron's and the New York Timesalmost daily. To stay ahead of market developments, macro trends, and market scuttlebutt that isn't mentioned in the news many investors, traders, institutions and individuals turn to Birinyi Associates. Click here to learn more about Birinyi's newsletter and one of the finest research products available, the Mini-Institutional service. 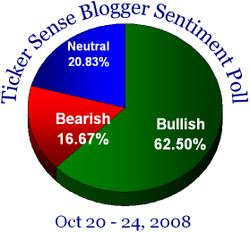 This week's poll continues the overwhelming bullishness. Warren Buffet's encouraging op-ed in the New York Times today may have inspired some buyers this morning, but after a world-wide credit crisis, weakening home prices, and the crumbling of several of the world's most prestigious financial institutions, how much will investors really be willing to pay for earnings. 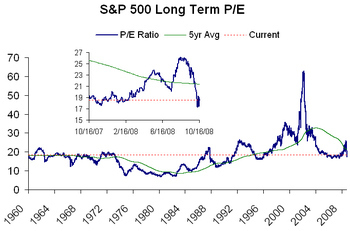 Shown below is the 12 month trailing P/E ratio for the S&P 500, its current level and the 5 year average. The average has been declining since the first quarter of 2004, where it peaked, but this could also be a cyclical signal that earnings will have to become much more robust before buyers are willing to bet on future earnings. A quick recession that's over before it starts (on an announced basis) would be encouraging. 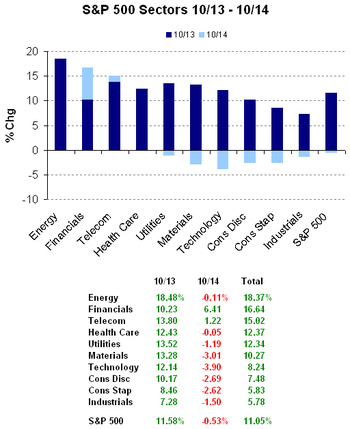 In any case, the market's P/E ratio is still above its long-term lows, but below any kind of inflated state and continued healthy earnings (like those of Google and IBM) will be a long term positive once the fear leaves the market. 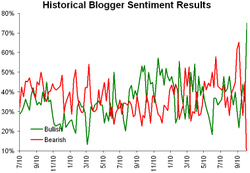 As a result of technical troubles we were forced to re-poll our bloggers yesterday during the trading day. Yesterday's near 1000 point gain has all the bears running for cover. 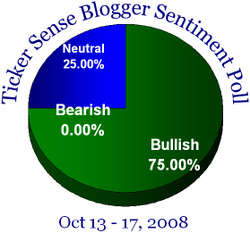 Even Roger Nusbaum (Big Picture) is a bull, which I think might be a first ever on Ticker Sense. 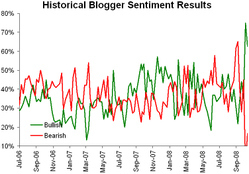 GE: Throw in the Towel? GE, traditionally thought of as the safest of havens, the quintessential anchor for any portfolio, may have disappointed a lot of investors today. On a day when the market was up over 11%! 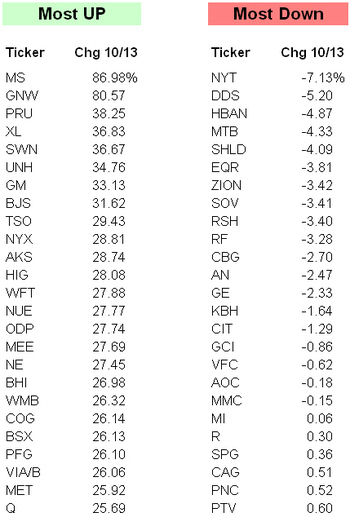 the best day in stocks since the 1930s, and when 481 of the S&P 500 stocks were up, GE was down 2.3%. We would not have been surprised to see GE up 10 - 15% after being down over 40% on the year, and while it might not be a comfort, there is some relief in the fact that today may be explained by an imbalance from Friday. So don't give up yet. Shown below is a two day chart of GE, with the price at 4:00 pm highlighted by the dotted red line. As shown, there was a buy-on-close imbalance on Friday that resulted in an unfairly high closing price. 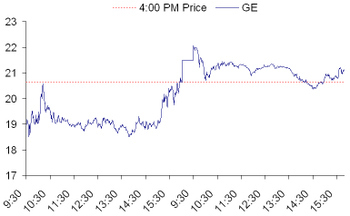 If we take the 4:00 pm price GE was actually up $0.37 today.